The Ironclad Triple Threat TPT554-LG is designed with an extended overhang for safety. Regulation court striping calls for the backboard to be positioned 4 feet into the court from the baseline. Therefore the TPT554-LG is the lowest cost unit in our product line to be designed with this 4' extension. The TPT554-LG is built so that when the rim is raised to regulation 10' height, the distance from the front of the post to the front of the backboard is 48" (4'). This extra "run-out room" is preferred where higher speed play is expected. This is typically the case for larger court designs such as a half or full court. The TPT554-LG is a great unit for those situations where the extra overhang is needed without spending the extra money for a regulation size backboard. See below for additional great features included with the TPT554-LG. Easy Adjustment: Adjustable from 10' down to 5' with easy reach crank actuator and rim height indicator. Thick Glass Backboard: 36" tall x 60" wide x 1/2" thick tempered glass. 48" Offset from Backboard to Post: Helps avoid player contact with the post especially for high speed layups. Heavy Duty Post: 5”x5” x 7 gauge square pole is extra rigid even under slam dunk action. 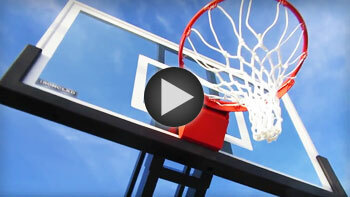 Breakaway Rim & Net: Gymnasium quality breakaway rim and net. Bolt-down Installation: Installation is easy with bolt-down post design. Allows easy goal relocation if you move. WeatherShield Undercoat Protection: Each steel component is dipped in molten zinc, galvanizing it against rust. Powder Coat Protection: Each unit has black powder coat paint for a superior weather resistance. Safety Padding: Post, Gusset and Backboard Pads included for player safety. Couldn't have been more pleased with my purchase. This was the best value I found after months of internet research. Goal was delivered timely, instructions were easy to follow. I was wanting a goal my wife could adjust easily and this one definitely does, I have no doubt that as soon as my boys can reach it they'll be able to adjust. I did the concrete and prep work with father in law and then it took three adults to get the backboard up -- exactly as instructions indicate. I've been playing almost every day, would highly recommend.